Helping vets find jobs and funds when they need it. Mr. Vern Frary is an 85 year old vet who was found standing on the street with a sign asking for a job. 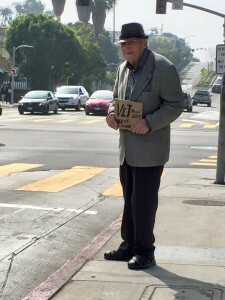 This touched many people around who came by to offer a few dollars. Mr. Frary is very keen on getting a job like operating a phone (he used to be a car salesman), and we are energized by his enthusiasm and want to help. In the meantime, we are also trying to support him with donations. When asked how much money he might need, he said a $100 a month might help him although he insisted that he’d rather have a job. He is currently in a senior nursing home.. 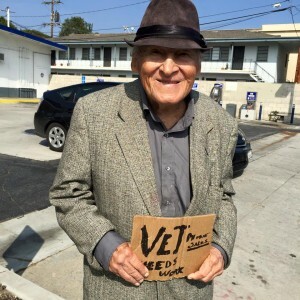 There are many vets like Mr. Frary who need our help. Project VET will strive to help Mr. Frary and other vets in need. Donations by July latest. A job by October if possible.